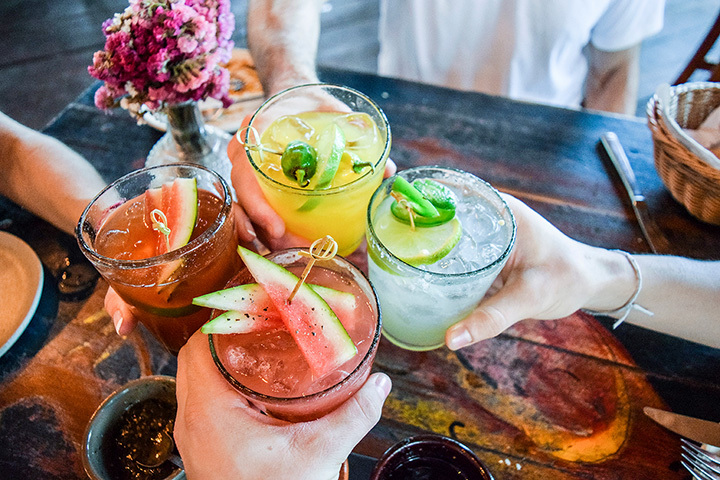 Dive bars provide a local watering hole vibe, Irish pubs offer a comfortable, laid-back atmosphere, and cocktail bars give us an upscale aura with expert mixologists. If you’re looking to go out and get a taste of something truly unique and delicious, visit one of West Virginia’s excellent cocktail bars. Next time you’re craving a martini, a margarita, a daiquiri, or something else of your choice, check out our favorite cocktail bars in the Mountain State! Considered by many to be one of the most progressive restaurants in the state, Hill & Hollow in Morgantown, West Virginia, prepares international cuisine superbly without compromising Appalachian flavor heritage. Reflected in both food and drink, patrons will find contemporary and delicious starters like a fresh vegetable and ramp hummus or blue crab esbcabeche with grilled pineapple, red pepper, coconut milk, and aji rocoto. Entrée choices include the very popular Caribbean candy snapper with mango mirasol butter, fried plantains and coconut rice or seared lamb filet mignon with tarragon-lemon yassa. They have a full-bar and serve hand-crafted cocktails like Fall Sangria, a delightful combination of smoked apple, pinot grigio, Kraken spiced rum, maple-allspice simple syrup, and Gosling’s ginger beer or Prairie Fire with organic vodka, kaffir lime leaf, lime juice, jalapeno, and raw sugar. You won’t find a more romantic location for your dining experience, and they’re available for parties and other events. Serving signature dishes from their menu like Adult Fries, made with jerk chicken, black beans, smoked gouda, sweet potato fries, and cilantro aioli, and bacon date tarts, with feta and asiago cheeses, dates, bacon, and balsamic glaze, the Cellar Door in Huntington, West Virginia, takes small plate-dining to a new level. With a full selection of wines and craft beers, you’ll find specially made cocktails like the Flood of ’47, featuring 1800, Silver Tequila with House Citrus, Chambord and Grand Marnier. This isn’t just dining—it’s an experience. Guests at the cute white cottage known as the French Goat in Lewisburg, West Virginia, will be hard-pressed to find such dedication to the craft of fine dining and cocktails. You may choose to start with a bourbon ginger ale and lavender sugar cocktail followed by foie gras seche made with seared foie gras, orange-scented French toast, macerated strawberries, maple syrup, and chicken jus. Confit de Canard, crisp duck confit, oodon noodles, bok choy, baby beets, Thai basil, carrots, edamame and red Thai curry broth might be your entrée and dessert to complete your meal. Special events like Happy Hour and discounted drinks are posted on their webpage, and reservations are highly encouraged. Great food and a lively atmosphere is what awaits you at Black Sheep Burrito and Brews in Charleston, West Virginia. This surprising little burrito establish offers taco frocks with delicious varieties like beet tacos with orange cream sauce, duck and blackberry tacos and smoke salmon tacos. Their cocktails are some of the best around with choices like a pineapple mule. They also offer special event catering. Sporting a great atmosphere and friendly servers, Celsius in Charleston, West Virginia, also has live music on selected nights. The food is prepared, cooked, and served perfectly, with such delicious items like filet sliders made with cooked-to-order filet mignon, Gorgonzola cheese, cherry peppers, and bacon. Well-made specialty cocktails, a nice variety of wines and craft beers round out the eclectic menu. If you want to try some interesting and unusual cocktails, stop by the Fifth Floor in Clarksburg, West Virginia. With a wide selection of beer, wine, and other specialty drinks like their Martinis, this is a surprising little spot. The bartender is quick and ready to make suggestions if you need them. This is a great little place with great service, great ambience, and a great view of the city. Another surprising bistro with great qualities, Noah’s Eclectic Bistro in Charleston, West Virginia, will not disappoint. Reservations are highly recommended because this 10-table eatery is very popular and only open for dinner Wednesday through Saturday. Using the freshest local foods, Chef Noah changes the menu to accommodate seasonal favorites like watermelon salad, swordfish escabeche, made with pickled peppers, onions, carrots, and tomatoes, and chocolate lava cake served with fresh berries and vanilla ice cream. They also have a great wine selection and make handcrafted cocktails. Located in an old pharmacy in downtown Morgantown, West Virginia, Tin 202 uses fresh ingredients provided by local farmers to create innovative and delicious menu items. They have a nice selection of tapas, soups, ceviche, main dishes, and desserts, and no one will walk away hungry or disappointed. The hand-pressed juices combined with fresh fruits and herbs make old cocktails favorites new and new cocktail flavors celebrate local history and creative mixology. Nestled away in Bridgeport, West Virginia, is a delightful gastropub called Cody’s Restaurant. This small but intimate eatery has some of the best cocktails around, and everything is intentionally prepared to give the best dining experience possible. Friendly and attentive servers and bar attendants make sure that diners have everything they need, and make food suggestions on request. Cody’s gets rave reviews on social media sites, making it a place you definitely want to try. Opened in 2010 by brothers Andy and Tim Coble, Hillbilly Heaven Bar & Grill in Berkeley Springs, West Virginia, is about as unique as it gets. This bar and grill puts great food and great service at the top of the list, and also has a large selection of beer and wine in addition to specialty cocktails. They offer designated driver services, and are proud that their eatery gives a place for customers to feel comfortable and have a great time.